Trapped behind the Adirondack Mountains and a tremendous ice sheet, glacial Lake Iroquois was three times the size of modern Lake Ontario. Then, 13,350 years ago, the natural ice dam collapsed. Floodwaters rushed down the Hudson River Valley; past modern Manhattan, Brooklyn, and Staten Island; through an earthen dam where the Verrazanno-Narrows Bridge now stands; and across another hundred miles into the North Atlantic. The water level in Lake Iroquois dropped 120 meters (400 feet), and rocks the size of Volkswagens moved hundreds of miles downstream. Beyond reshaping the landscape, the catastrophic flood also had dramatic impacts on Earth’s climate. It may have triggered a brief but global period of colder climate known as the Intra-Allerod Cold Period, said Jeff Donnelly, a geologist at Woods Hole Oceanographic Institution. The torrent from the glacial lake would have thundered into the North Atlantic, adding a vast freshwater “lid” on the ocean surface that could have rearranged ocean circulation and changed climate patterns, said Donnelly, who is a fellow of both the Ocean and Climate Change Institute and the Coastal Ocean Institute at WHOI. Scientists have long suspected that large discharges of glacial water into the ocean could drive climate fluctuations, but linking discharge events like the Hudson flood with individual climate changes has been difficult because of the challenges in pinpointing the location, timing, and amount of the discharges. 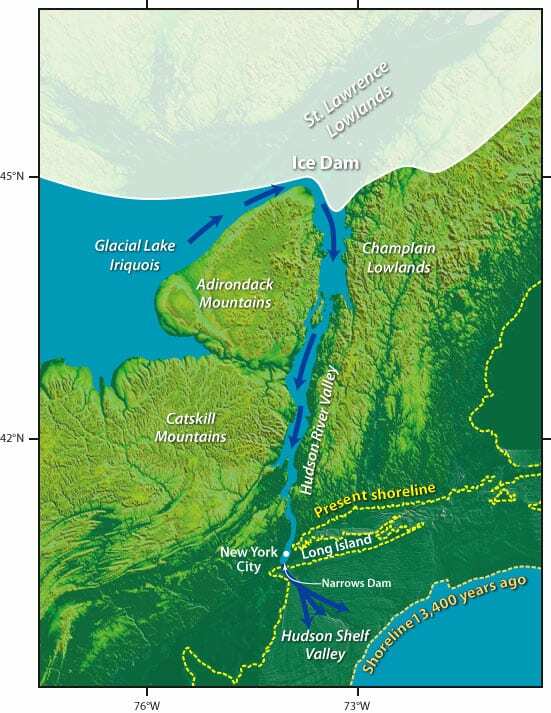 Donnelly and colleagues analyzed sediments from the Hudson River Valley, which extends under water on the continental shelf (see map). On huge sediment lobes on the shelf, where sediments are normally the size of sand grains, they found car-sized boulders—which were likely pushed there by the great flood. The team also analyzed ancient pollens deposited by the flood in sediments near the Tappan Zee Bridge and the Holland Tunnel, as well as walrus fossils buried by the flood in the offshore sediment lobes. 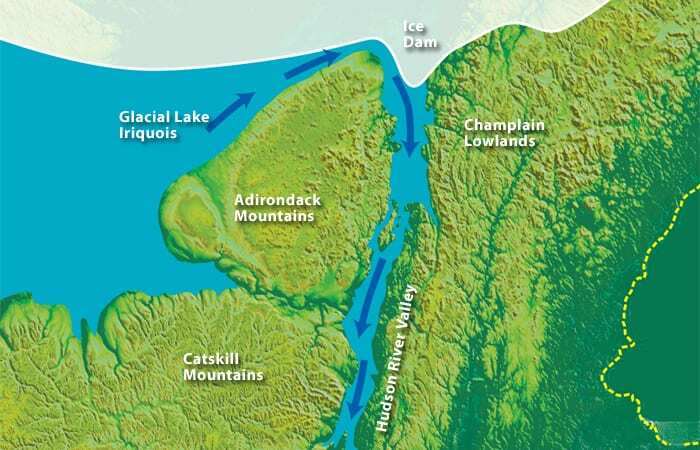 The results precisely dated—for the first time—the discharge from Lake Iroquois and linked it to the Intra-Allerod Cold Period. Donnelly and colleagues described the historic flood and its effects in a February 2005 paper in the journal Geology. Funding for the research was provided by the John E. and Anne W. Sawyer Endowed Fund, the Office of Naval Research, the WHOI Postdoctoral Scholar Program, The J. Lamar Worzel Assistant Scientist Fund, and the WHOI Ocean and Climate Change Institute.